A generously proportioned, supportive floatation device for the smaller swimmer. Secure, stable and adjustable seat attaches to float. 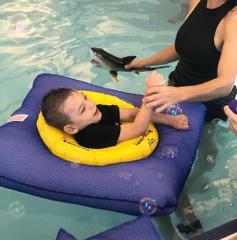 Allows swimmer to kick and splash freely while sitting upright in supported comfort. Intended for the swimmer with weak legs but with good neck and upper trunk control. Please note that this float is made to order and ships from Australia- so please allow 2-3 weeks from time of order to delivery. Click on the thumbnail images for a closer view. 9396B (Baby) this is for children 3-6 years with chest measurements ranging from 22 to 25 inches. The inside of this float is 8 x 8 inches. Suits weights up to 55 lbs. 9396C (Child) this will be for children 6 to 12 years with chest measurements of 25 to 31 inches. The inside of this float is 10.5 x 10.5 inches. Suits weights up to 110 lbs. 9396Y (Youth) this will be for children with chest measurements of 31 to 40 inches. The inside of this float is 13.5 x 13.5 inches. Suits weights up to 182lbs. 9396A (Adult) this float is for Large to X/Large adults with chest measurements of 40+ inches. The current inside of this float is 15.7 x 15.7 inches. Suits weights 200+ lbs. Between Sizes or want more support? 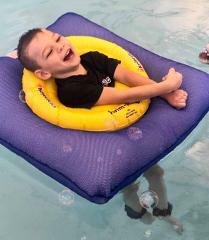 If there there is too much space around the swimmer, a Swim Ring Fabric Float (Item# 9397) can be positioned under the CP Square Float to provide bulk and additional support around the swimmer.